Large, natural late glacial lake which formed a central feature in pre-Norman Brycheiniog and is now the focus for nature conservation and watersports. The lake is associated with much early folklore and with artificial island or crannog unique to Wales which formed an early medieval royal residence. Evidence of much earlier, Mesolithic activity and sediments of significant regional palaeoenvironmental potential. As noted above in the historical background to the Tal-y-llyn historic landscape character area, historical evidence associates the area of Llan-gors with the royal and episcopal estates from about the 8th century. 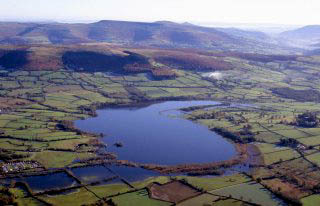 Both historical and archaeological evidence suggests that the crannog towards the northern side of the lake was a residence of the kings of Brycheiniog in the 9-10th centuries. The Anglo-Saxon Chronicle records that in 916, Aethelflaed sent an army into Wales three days after the murder of abbot Ecgberht and his companions. The army stormed Brecenanmere (‘Brecon mere’) and captured the king’s wife and over thirty other members of the court. The attack on the mere almost certainly refers to the crannog, and the capture of the wife of king Tewdwr ab Elise. The Book of Llandaff records the grant of Llan-gors to the church of Llandaff by the king of Brycheiniog in the 7th century. Gerald of Wales in his Itinerary written in the later 12th century notes that the lake supplied pike, perch, trout, tench and eels. The fishing rights were granted to the monks of Brecon priory and there is a mid 13th-century reference to the use of a boat. John Leland refers to the stocks of fish in the lake in the early 16th century. A map of 1584 shows two boats drawn up on the bank of the lake, a watermill where the Llynfi joins the southern end of the lake and three eel traps are shown where the river flows out of its northern side. A survey of the mid 17th century entitled ‘A Survey of a certain Poole or fishing Poole commonly called Llinsavathen’ refers to the presence of wears at which ‘good store of Eles taken in potts’. Gibson’s 1722 edition of Camden’s Britannia mentions the use of coracles for fishing. Llan-gors (or Llangorse, the anglicized version of the name) is taken from the adjacent village which is derived from the Welsh llan ‘church’ and cors ‘reeds, marsh, bog’. The lake has also been known by the Latin name Clamosus, by the Welsh name Llyn Syfaddan (or Syfaddon), and also as Llan-gors Mere, Brecknock Mere or Mara de Brechonia and various other forms. A view of the lake showing groups of fishermen in boats was painted by the Welsh landscape artist Thomas Jones probably in the last decade or two of the 18th century. The lake has been a pleasure resort since the early 19th century, having been used for boating, fishing and wildfowling, private boat houses and landing stages being shown on 1st edition of the Ordnance Survey on north and south shores in the 1880s, the coming of the railways in the later 19th bringing visitors to Tal-y-llyn Station which lies within a mile of the lake. Today the lake is a focus for the competing demands of tourism, nature conservation and watersports. Natural lake of glacial origin, about 133 hectares in extent and second only in size in Wales to Llyn Tegid, Bala. The lake is up to about 8.5 metres deep, at a height of about 155 metres above sea level and probably cut into solid rock at its deepest levels. The lake, which is surrounded by 10 hectares of reed beds, is fed and drained by the Afon Llynfi which enters it at the south-east and leaves it to the north-west. The water level in the lake is retained by a barrier of glacial gravel reinforced by more recent fan deposits, brought down by streams rising on Mynydd Troed and Mynydd Llan-gors to the north-east and east respectively. The lake surface and the adjacent common are registered Common Land. Sediments deposited in the base of the lake provide an important record of palaeoenvironmental change in the area since the end of the last ice age. Study of these sediments within the lake indicate a decrease in tree pollen and an increase in sedimentation during the period between about 3800–950 BC, suggesting a period of forest clearance and arable agriculture during the Neolithic and Bronze Age periods. A further substantial increase in the rate of sedimentation has suggested an intensification of arable agriculture and increased soil erosion in the Roman period, at about AD 250. Further increases in the rate of sedimentation took place at about the beginning of the 19th century, probably in response to the cultivation of marginal hill-lands within the catchment area of the Llynfi. The suspended sediments carried into the lake by streams in winter and spring is not a recent phenomenon: in the later 12th century Giraldus Cambrensis noted that the lake was at times tinged by red, as if blood flowed through veins and small channels. The artificial crannog, called Ynys Bwlc, forms a small island crowned with shrubs, about 40 metres by 30 metres across, which protrudes up to a metre above the surface of the lake but is sometimes submerged below its surface in the winter. The crannog which supported the settlement lies about 40 metres from the north shore of the lake and was constructed of two concentric rings of oak piles revetting a platform of small pieces of sandstone placed on a lacework of timber overlying brushwood matting. The piles are driven through a layer of peat which includes much earlier, Mesolithic finds. Dendrochronological dating shows that the crannog was built in the 890s though the mound also includes some Roman material in its make-up. Excavations in the 1860s and between 1987-93 have shown that the crannog was defended by a palisade and probably comprised an early medieval hall comparable to the contemporary Irish royal crannog sites, and was connected to the shore by a wooden causeway up to 3 metres wide. The high quality of some of the associated artefacts, which include an antler comb, embroidered textile, parts of a portable shrine, two log boats (including an earlier find), carbonised grain and animal bone, support its identification as one of the early royal sites of Brycheiniog. It has been suggested that it may have been a centre of royal administration, as well as a place for hospitality, where the ruler received tribute as well as taking part in sporting activities such as wildfowling and fishing. The site seems to have been influenced by Irish building techniques, and was possibly constructed with the assistance of Irish craftsmen. A foundation legend of the royal dynasty of Brycheiniog claimed descent from Irish ancestry. The use of this unusual construction method in Wales may have been intended by later kings to substantiate these claims and thereby enhance their social and political standing. A charred horizon recognised during the excavations may represent the attack by Aethelflaed’s army in 916. In 2005 a stone bund was constructed around part of the crannog to protect it from further wave action. CCW SSSI citation; CPAT Historic Environment Record; Arnold and Davies 2000; Burnham 1995; Camden 1586; Caseldine 1990; Chambers 1985; Davies 1999; Davies 2000; RCAHMW 1997; Figgis 1995; Fox 1926; Granger-Taylor and Pritchard 2001; Jones et al. 1985; McGrail 1975; 1978; 1979; Manning 1895; Mumford and Redknap 1999; North 1957; Raikes et al. 1986-87; Redknap 1993; Redknap 2000; Redknap 2002; Redknap and Lane 1994; Redknap and Lane 1999; Sims-Williams 1993; Smith 1906; Thomas 1994; Waite et al. 2005.